A Year Through The Lens: Day 93 – Aladdin’s lamps. 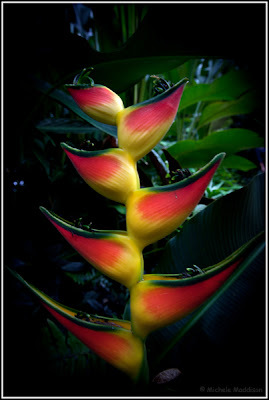 Popping out of the lush tropical garden like a series of Aladdin’s’ lamps; heliconia’s are starting to pop up creating pockets of colour in the lush green. It is one tropical plant that always intrigues me, as they come in different forms, hanging from trees and appearing from the ground. It’s a shame you can’t rub it and get three wishes from the genie inside. What would you wish for?